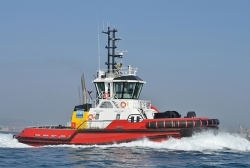 Caterpillar Marine has announced a collaboration with Sanmar Shipyards in Istanbul, Turkey to build a tugboat with a hydraulic hybrid propulsion system. Cat Marine will supply its Advanced Variable Drive (AVD), a patented system designed to provide improvements in both fuel efficiency and vessel performance through a fully integrated hydro-mechanical propulsion system. The Sanmar hydraulic hybrid tug will be a Robert Allan-designed RAmparts 2400SX harbour tug incorporating an integrated Caterpillar AVD system of 3512 main engines, a C32 auxiliary engine, Caterpillar MTA 627 fixed-pitch tug thrusters, and bridge controls. It will carry FiFi 1 designation with 70T metric bollard pull, and will be supported by Turkish Caterpillar dealer Borusan Makina. The AVD system will also include a fully integrated controls system with customisable operating modes and display panels at the bridge. Compared with a conventional tug with equivalent bollard pull, the ROI is estimated at three years or less based on projected fuel and operating cost savings. “This strategic development between Sanmar and Caterpillar will provide a highly optimised, lower-cost alternative to conventional electric hybrid systems, with similar benefits regarding improved performance, lower noise and lower emissions,” said Ali Gürün, director of projects, Sanmar Shipyards.